Panoramic views of the Sangre de Christo mountains cast and blazing western sunsets frame the new Southwestern adobe style Inn at the entrance to Taos Ski Valley and Carson National forest. Each of eight guest rooms has unique southwestern decor, a kiva fireplace, and private bath (several with jacuzzi tubs or double shower). Guests receive a delicious full breakfast, afternoon snacks with a complimentary glass of New Mexico wine. The Bed and Breakfast location provides easy access to hiking and biking trails, horseback riding, fishing, skiing, river rafting and golf. Cool summer nights, glowing yellow aspen covered mountains in the fall, and 100 inch base in the Taos Ski Valley in winter are but a few of the attractions just out the door. 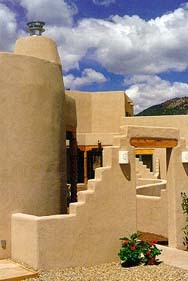 Taos, a recognized art center, features many galleries, museums, and world class dining.